Product #16522 | SKU UWPD12CE42 | 0.0 (no ratings yet) Thanks for your rating! 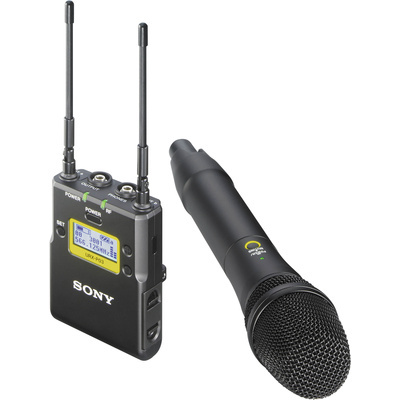 The 638 to 698 MHz version of the Sony UWP-D12 Integrated Digital Wireless Handheld Microphone ENG System features all-metal construction, easy to read LCD displays, a wide switching RF bandwidth, USB power and charging, automatic channel scanning, infrared synchronisation between the transmitter and receiver, a true diversity receiver, a headphone output on the receiver, output gain control on the receiver for optimising input level to a camera, and digital companding circuitry to improve the transient response of received audio. The package is suitable for a wide range of wireless applications such as ENG, talk shows, lectures, and more. The system is referred to as integrated digital because the transmitter and receiver utilise DSP for digital companding and expanding of the transmission signal. Performing the companding and expanding processes in the digital domain improves the accuracy and transient response of the received audio. The camera-mountable receiver features true-diversity technology which stabilises reception and minimises RF interference by using dual antenna input/reception circuits and selecting the strongest incoming signal. The angle of the antennas is also adjustable to improve reception when the receiver is mounted on top of a camera or camcorder. The system utilises UHF Phase Locked Loop (PLL) synthesis to lock the phase of the transmission frequency between transmitter and receiver. The receiver can automatically search for an available transmission frequency and link the desired frequency to the transmitter via infrared connection. A stereo mini-jack output with monitor volume control is featured and both stereo mini and stereo XLR cables are provided. The unit also includes a headphone monitor output for use with cameras and camcorders that don't have a monitor output. An LCD display provides channel and frequency information, battery life, RF-input level, audio-output status and accumulated operating time. The capsule is removable and can be interchanged with over 40 compatible microphone capsules from various manufacturers, such as the industry standard Shure SM58. The transmitter can operate for up to 8 hours on two AA-size alkaline batteries, can be powered or recharged via USB micro B connections, and features a comprehensive LCD display. The system comes with a screw adapter, a belt clip, a shoe-mount adapter, a 3-pin mini to mini stereo cable, and a 3-pin mini to XLR cable. Optional accessories such as a microphone holder, battery case, and soft case for the receiver are sold separately.